A macular hole is an abnormal opening that forms at the center of the retina (macula) over a period of several weeks to months. Central vision may become blurred and distorted initially. If the hole progresses, a blind spot develops in the central vision, similar to the picture you would get if camera film had a hole in the center of it. Side vision remains normal, and there is no pain. Most macular holes occur in middle aged or older people, especially women. The vitreous gel within the eye pulls on the thin tissue of the macula until it tears. The torn area gradually enlarges to form a round hole. Less common causes of macular holes include trauma and long-term swelling of the macula. Diagnostic tests such as a fluorescein angiogram or optical coherence tomography may be performed in order to determine the extent of the damage to the macula. A macular hole is treated with surgery. Macular hole surgery is performed with a vitrectomy, where instruments are placed into the center of the eye to remove the vitreous gel. The doctor may “peel” some tissues in the vicinity of the macular hole to help increase the chances of the hole closing after the surgery. The eye is then usually filled with a gas or silicone oil bubble. If a gas bubble is placed in the eye, the patient is asked to keep strict face-down positioning for a specified period of time. It is felt that the bubble inside the eye physically forces the retina around the macular hole that is detached to reattach. As this tiny area of retina reattaches, the edges of the macular hole will approach each other. This causes the hole to become smaller, and often but not always, to close. Silicone oil is substituted for the gas bubble if patients are not able to comply with face-down positioning. 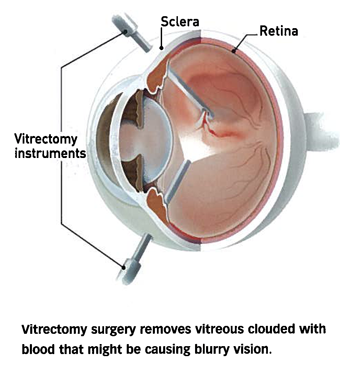 However, silicone oil use requires another operation to remove it in order for vision to improve. The eye slowly regains part of the lost sight over 2 to 3 months after surgery. The visual outcome may depend on how long the hole was present before surgery. Vision often does not return to completely normal.